The University of Rhode Island will be taking on several multimillion-dollar construction projects in the coming year to improve academic buildings and the campus image to prospective students. The most notable project underway is the new $150.5 million engineering complex, which was only made possible as of Nov. 8 when Rhode Island chose to vote in favor of the bond referendum the project requires. Demolition for the new engineering complex will begin sometime in January or February, according to Director of Capital Projects Paul M. DePace. Crawford, Kelly, Kelly Annex, Gilbreth and Wales Halls will all be removed to make space for the project, which will take up roughly 190,000 square feet. Kirk and Bliss Halls will remain, but major interior renovations will be done in Bliss to maintain the historical integrity of the Quadrangle. Once the buildings are demolished, DePace said the plan is to put in underground utilities and preparations, before foundations go in. Construction of the buildings is scheduled to begin in the late summer of 2017. Dimeo Construction of Providence, Rhode Island, will be managing all of the bids the separate projects. In years past, other construction projects have been bid out as a single package to just one company, according to DePace. Other projects are expected to begin in the coming year but have yet to go to bid, including the White Horn Brook Apartment Complex, a new gateway welcome center, as well as improvements to Fogarty Hall. The White Horn Brook Apartment Complex, as previously reported by The Good 5 Cent Cigar, will break ground sometime this coming summer. The $94 million residence hall will take away 280 residence parking spaces from the Dairy Barn lot. The lesser known welcome gateway center will go in where the current information center sits, according to DePace. 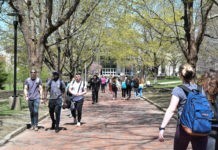 The $7.6 million project will be a tight fit in the current designated area, according to DePace, since the nearby trees are protected by the university. The project will also infringe on part of the adjacent parking lot. Improvements to Fogarty Hall are in the design phase at the moment, but the plans call for replacing some of the windows and disassembling the unoccupied greenhouse behind it, according to DePace. 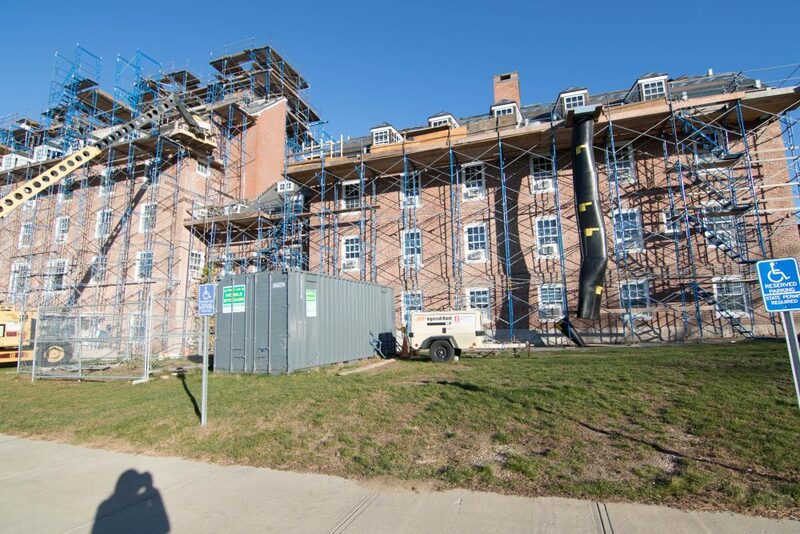 Currently at the Kingston Campus, Roosevelt Hall is undergoing major renovations. As the Assistant Director of Employer Relations at URI, Richard Song considers Roosevelt Hall his “home away from home,” and is no stranger to living in a construction zone. For him, however, having the structure of the building be up to date internally and externally is important, so the renovations are much needed in his opinion. All of the interior work is finished, but the outside renovations being made on the roof and brick mason work will not be completed until the end of December, according to DePace. Even then, the project may be “substantially complete” by the end of next month as DePace describes it, but last minute details or touches may hold the project back slightly. Although there are not any other major projects happening on campus at the moment, DePace said the university is always working to make small repairs and ensuring that the buildings are up to code. 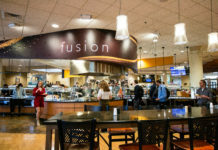 Since The Station nightclub fire of 2003, in which 100 people lost their lives, the state of Rhode Island has enhanced building fire codes and the university has been working to keep up. Over the past seven or eight years, URI has spent roughly $30 million on bringing buildings up to code, according to DePace. All of the residence halls and most of the academic and administrative buildings are up to date, but DePace said there are still a few in need of update. The university is working to complete the remaining buildings in a priority order.